There have been at least three primary drivers of the massive shift toward renting in the past decade: finances, demographics, and taste and preferences. Much of the discussion surrounding this overall shift has focuses on the finance issues — foreclosures, credit availability, ability to afford, lack of down payment, etc — and with good reason as this is the most visible aspect of the housing bust and impact of the Great Recession. However given the ongoing strength in multifamily housing today, key questions are being asked. Among them: how long can it last and how much, if at all, will ownership rebound in the future? In other words, when will the housing market hit peak renter? To answer, let’s examine those three underlying drivers. First, financial issues will continue to improve. Credit availability will loosen further (it has along some dimensions like down payments, yet not on FICO scores). Household balance sheets are largely in good to great shape. Strong economic growth, especially in the largest cities, is generating increased household formation, particularly among the higher income brackets. All of this suggests the market is, or will likely be, shifting toward ownership. Second, demographics have played a really large role to date, yet flown under the radar. This is likely due to the fact demographics are slow moving and primarily deterministic. It is nearly impossible to alter demographics in the near-term. 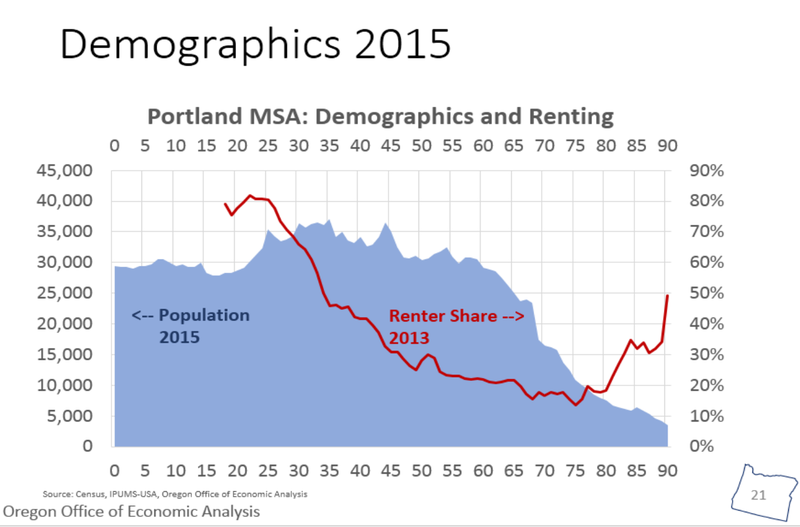 To illustrate this impact, the graphs below show Portland MSA’s population and renter share by age. The vast majority of 20-somethings rent, however ownership basically increases from about 25 years old through roughly 50 or 60 years old. This is true even in recent years following the massive shift into rental. Increased homeownership is one reason why our office refers to 25-35 being the root setting years. In fact, age 35 in Portland is the point where half of the population rents and half owns. Rental rates don’t increase again until 80+ years old — Boomers will hit this en masse in about 15 years. The big bulge of Millennials are impacting the multifamily rental market today. However in a decade, they will be 25-45 years old, with the highest number in their mid-30s. Such demographic shifts indicate there will be ownership increases as the Millennials age. These demographic trends are also something Bill McBride (aka Calculated Risk) has been researching. In fact, Bill was on Bloomberg TV’s “What’d You Miss?” on Friday talking specifically about demographics and housing (video here, starts at the 41:40 mark, ends at 45:10). Bill even used the above graphs and discussed the Portland market and demographics a bit. Pretty cool to see Bill on TV and using our graphs! Now, what is interesting here is determining what the demographic impact on the housing market will be moving forward. 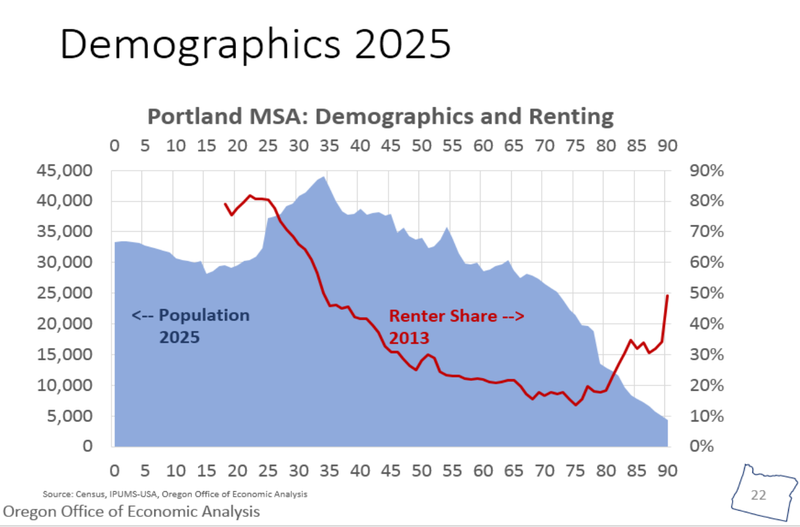 Below, I fix the rental shares by age and run our office’s demographic outlook for Portland through, thus producing a demographic-based projection for rental vs ownership. 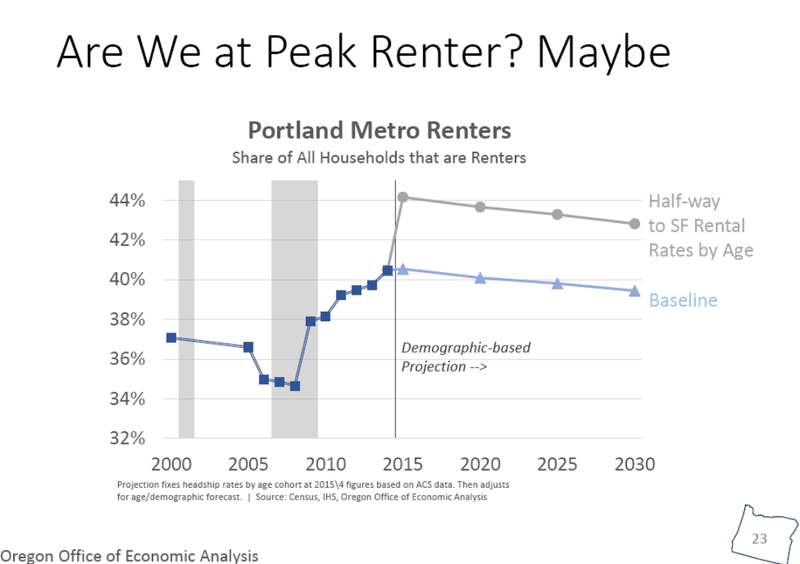 Under the baseline projection, demographics do suggest the market is somewhere near peak renter in Portland. Bill’s work indicates it may be another few years for the U.S. as a whole. However, even as both finances and demographics point toward more ownership, we have yet to discuss the third major driver into rentals today: tastes and preferences. This is the wild card and hard to gauge or measure for future trends. To what extent will residents permanently shift into multifamily? This is where the gray line above comes into play. I am using San Francisco rental trends as a placeholder and even then only going halfway to their rental rates. In the coming decade or two it is unlikely Portland could move all the way to SF rates, however we could move part of the way. The reason being, as Joe Cortright, from City Observatory, says, we have a shortage of cities today, particularly in the urban core of major metropolitan areas. Thus, even as demographics and finances suggest the housing market is fundamentally near peak renter, it is easy to see how the taste and preferences of residents can keep the share high, if not higher. All that said, our office remains skeptical that all of the shift into rental is permanent, even from a taste or preference stand point. When the Millennials do settle down, get married, have a couple of kids — at a later age than previous generations — we know single family with good schools looks a lot more attractive. Even so, it does look like most of the increase in rentals is likely to be permanent, particularly in light of the fact that no economist or housing expect I know is predicting a return to the pattern of development and growth seen during much of the past few decades. Even within the renter/owner calculus, as Bill talked about on TV, condos are likely to grow, which are, obviously, both owner and multifamily. Combine this with the possibility that retiring Boomers will actually want to downsize and live in the urban core (I think this is still an open question, not a done deal) and the outlook for multifamily remains strong. This doesn’t mean 2015 is “peak renter”. But this does suggest growth will slow for multi-family, but not a sharp decline. I’m interested in how the author can make this statement: “Household balance sheets are largely in good to great shape.” That doesn’t reflect many households I know that are struggling with housing costs, credit card and student loan debt, and are one missed paycheck away from economic disaster. Hi Nick, thanks for the question. You’re right, there are many that are still struggling economically, unfortunately. Not everyone has been a part of the recovery (see our report on Job Polarization in Oregon, or recent look at Rural Oregon). Our office’s concern is that the longer some of these bad trends last, the more permanent they become. That is why we have continue to work with and develop different measures of the economy like the Total Employment Gap that includes more than just headline unemployment but also those who have given up looking, and/or underemployed. However from a bigger perspective, the sentence stands given the overall growth and changes in the economy. Debt to income has come down, see our state level look. Also, given that even today debt is growing roughly in-line with income gains, low interest rates mean that households are spending a smaller share of their income financing/servicing the debt. For those able to own their home, they have locked in these financial savings for the life of their mortgage. Of course these are aggregates or averages and individual circumstances vary considerably.